Graduate Degree for engineering posts they are eligible for applying online for this West Bengal Govt Polytechnic Colleges Lecturer posts through WBPSC Recruitment Exam 2018. There are 598 posts are in this WBPSC recruitment. Candidates who are having passion of teaching they can apply online for this Polytechnic Colleges Lecturer posts before 13-08-2018 through official website of www.pscwbapplication.in. 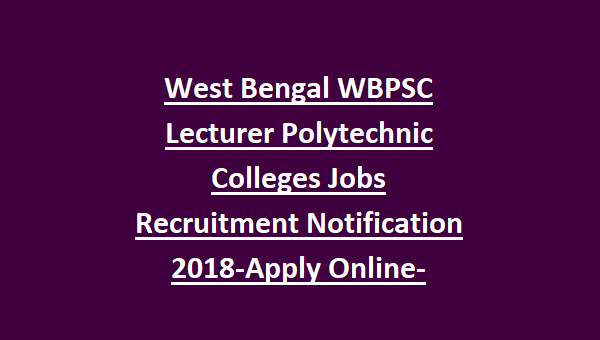 Written Exam and Interview will be conducted for this West Bengal WBPSC Polytechnic Colleges Lecturer Posts recruitment 2018. More details about this WBPSC Exam for Polytechnic Lecturer jobs selection process, online application procedure exam pattern, exam syllabus and other details are given below. 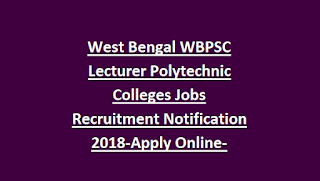 There are 598 Polytechnic Diploma Lecturer vacancies in WB Govt Polytechnic Colleges Lecturer recruitment of WBPSC Exam 2018. Age limits cutoff date is 01-01-2018. Age limits for General candidates is 18-37 years. For reserved candidates age limits are applicable as per the norms. Candidates must have qualified B.E or B.Tech in respective engineering subject or PG Degree in respective non engineering subject. Application fee is Rs.210/- for general and OBC candidates and other charges are applicable as per the norms. Candidate's selection is based on screening test and interview for this Lecturers recruitment 2018. Online applications are accepted for this WBPSC Poly Lecturer posts from 24-07-2018 to 13-08-2018. Official website to apply online for this WBPSC Exam is www.pscwbapplication.in. Exam Pattern, Exam Syllabus, admit card release date, exam key, screening test result and other details will be updated in this website only. Check result here for exam of WBPSC .